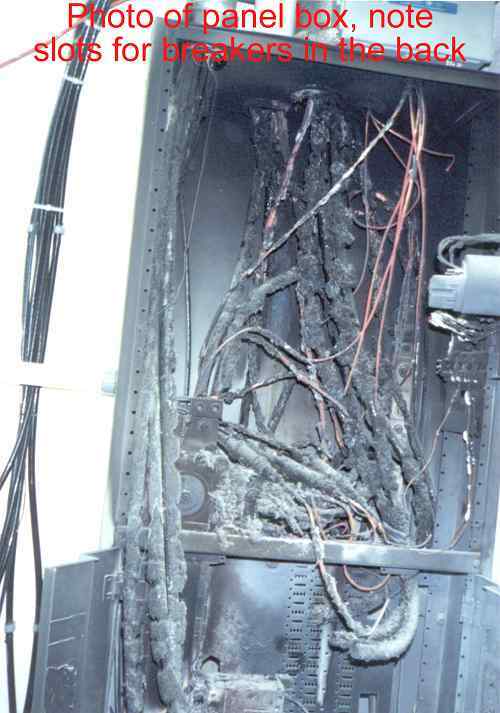 Register Log In ECN Forum Forums Safety News and Product Recalls 480 Volt Near Miss! The attached is a Washington state Dept. of Labor and Industries official report on a 480 Volt near miss that happened last July. No was killed but one electrician was seriously burned and needed multiple skin graft surgeries. Thought you guys could post it on your web sites. BTW. Your web sites are absolutely fantastic. Keep up the excellent work. Thanks. Three (3) employees of xxxx Electric were working at the Verizon building on 13 South Benton in Kennewick. Ed xxxx, Richard xxxxand Brian xxxx. Ed was the supervisor, Richard was the foreman and Brian was the electrician. Prior to start of work they had a meeting to discuss their job and determine how they were going to do it. According to statements and interviews the panel was energized, which is normal procedure, at approx. 2:45am on the morning of July 12, 2001 Ed had moved a 225-amp breaker down a notch, he then proceeded to move a 400-amp breaker down one notch. Just after he had popped the 400-amp breaker loose and was attempting to relocate it something happened, there was an apparent short somewhere and a ball of fire came from the panel, which caught him on fire. Richard and Brian attempted to put the fire on Ed out, at that time Darrell xxxx, of HP Construction came in with a fire extinguisher and squirted Ed with it, by then the room was full of smoke and the panel was still burning. Ed suffered burns to arms and chest; Richard had smoke inhalation, as well as minor burns. Brian had smoke inhalation, all 3 were treated at the Kennewick Hospital, and Ed was taken to Harborview in Seattle. The generator was started to carry the load. Breakers are removed by sticking tool into a slot and then the breaker pops loose. There were no apparent causes of this accident, other than there was a short somewhere in the panel. 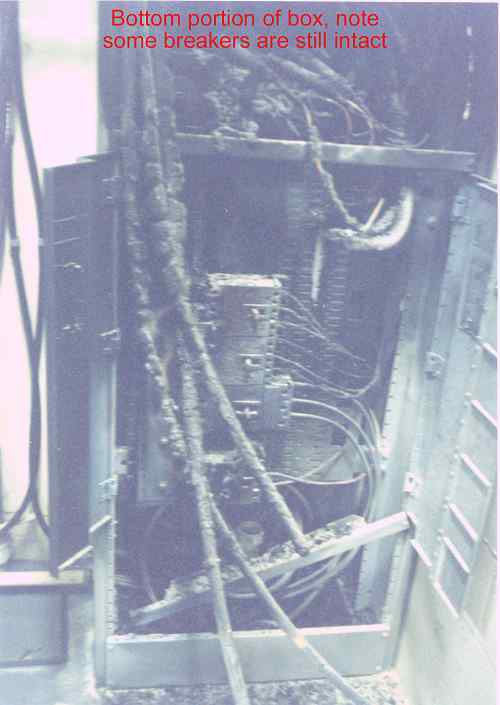 It is normal practice to move and remove circuit breakers without disconnecting the main power to the panel. In this case it would have been disconnected at the transformer on the pole outside. It was not because this was normal practice and has been for many years, even Square D does not require that the panel be de-energized prior to removing or installing breakers, they do however recommend it. Chap 155-428-1-f says the following: Work on energized equipment. Only qualified persons shall work on electric circuit parts of equipment that have not been de-energized under the procedures of WAC 296-155-429(4). Such persons shall be capable of working safely on energized circuits and shall be familiar with the proper use of special precautionary techniques, personal protective equipment, insulating and shielding materials, and insulated tools. How many of us have jacked I-line breakers in and out of a live bus? Fire came bellowing out of the service panel"
In the report, one item in the sequence of events is probably incorrect. 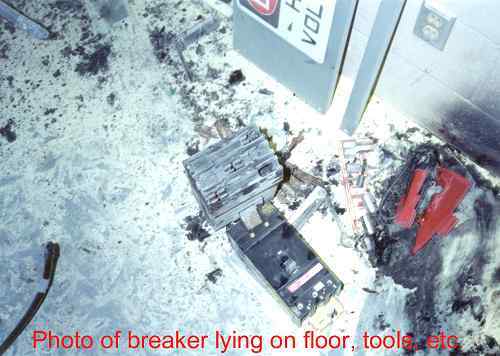 The fire probably started before the "transfomer fuse blew." Likely the panel fire was longer term, though. Pardon the nit picking, but calling this incident a 'near miss' seems to be stretching the meaning of the term a bit, no? MY IEC INSTRUCTOR ALSO HAD AN ENCOUNTER WITH AN I-LINE PNL(480-277V). HE SAID THE PANEL WAS OUTSIDE ABOUT 20'FT. FROM THE PAD MOUNTED XFMR, IT WAS MORNING WITH SOME DUE ON THE GROUND. HE HAD ALREADY TAKEN THE COVER OFF AND WAS ABOUT TO PUT A WRENCH TO THE FIRST BOLT HOLDING THE DEAD-FRONT, A FLASH OCCURED, GIVING HIM BURNS TO THE FACE AND HANDS. HIS WRATCHET-WRENCH WAS WELDED AT THE END FROM INNER ROTATING PART TO THE SOLID PART. HE HAD TO HAVE SKIN GRAFS ON ONE OF HIS HANDS, NOT TO MENTION LOOSING MOST OF HIS FACIAL HAIR. THE EXPLENATION GIVEN TO HIM FOR THE FLASH WAS THAT THE AIR "IONIZED" CAUSING THE ACCIDENT. JUST THOUGHT I'D RUN THIS BY YOU AND TO SEE WHO ALSO HAS A STORY ABOUT I-LINES.